Not everyone has to sit, but when they do Office Furniture Concepts makes sure they do comfortably. Let us help you outfit your space with the best ergonomic seating situations. Whether it’s an executive desk chair or the best office chair for the best office worker, we have what you need. All our different models of office seating vary greatly, depending on the need of the customer and the needs of the office. Here at Ofconcepts you can find the best office chair. If your company needs ergonomic seating that is designed for intensive, continuous use, we have you covered. If it is a computer office chair, executive chair or a simple mesh chair to complement your contemporary office desk, there is practical product for everyone and every need. A vast selection of chairs with lasting beauty and high quality for your reception area or any area! A full line of seating for large or small groups. Fine selection of stools and drafting chairs for fast, free delivery! Our Cafe and Bistro chairs adjust to your body weight for optimum comfort and support. Healthcare seating combines "At home" comfort, with caregiver convenience and cost effectiveness. Every office has the need for modern day computers, ergonomic seating, which includes the best office chair and the executive desk chair that’s unfamiliar to the workroom chair user. Also business electronic devices are a necessity to produce the highest, most polished work to stay competitive in your field. We keep this in mind and have a wide range of not only regular office chairs, but also computer chairs that are ergonomic seating friendly. This, along with our lines of business office furniture let you be confident you are getting the best furniture for the best value. Whether you’re an established big player or an up-and-comer looking to get huge, size does matter. Perhaps the most striking part of every conference room is often the size of its conference table. Big tables make big statements at your office wide meetings and conferences. However, the most often used part of the conference room is the conference chairs. Do you have the best office chairs? IS your company’s executive desk chair fitting for the person up top? With this in mind, Office Furniture Concepts provides a number of different lines of conference chairs that will complement and enhance all conference room tables that your office might use. Enhance your conference room areas with timeless elegance or modernized styled seating that makes the correct impression for those business projects, long meetings and fun get-to-gathers. Executive offices and executive furniture has to be set apart from the rest of any office. Sure the workforce will fight for the best office chair. Whoever is left without it will likely day dream about and executive desk chair. Make sure their dreams come true. Leave it to Office Furniture Concepts to not only provide the correct executive desk, but also the perfect executive desk chairs to synchronize with the rest of your office. Choose from our fine collection of quality seating at prices only a boss can appreciate while still maintaining the correct executive office feel and look. Let Office Furniture Concepts make you be a cut above the rest. A first impression is everything, well, at least sometimes. A place to welcome guest and visitors to your business and office is not only a necessity, but also a great place to set the correct tone and impression for the first time. We provide the best reception area office furniture as well as the best office chairs designed for guest and office personal. With the correct and most comfortable place for guests, no time will ever be unpleasant for anyone. Utilize these ergonomic seating options to assure the guests stay as pleased with your company as the workers are. These guest chairs don’t just make any impression, they make an initial impact for your business. Your business is great. 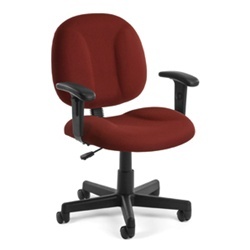 Let the customer know you are with the best office chair and guest chair on the market. The look, color and feel of the best leather office furniture cannot compare to any other type of furniture. No doubt the executive desk chair is the best office chair; it’s only the nature of the business process. With this in mind Ofconcepts carries a gorgeous line of affordable executive desk chairs, other office furniture and workstation ergonomic seating made of classy, durable leather. The different lines of leather office furniture include leather chairs and other seating We offers a tremendous selection of quality executive leather seating, which won’t leave you disappointed or uncomfortable. All managers and people in charge need a no-nonsense aura and look around them to complete any task that may pop up at any time. Ofconcepts is not only sensitive demand of the business clock and time frame, but also has the best seating options for executives and those in managerial positions. The convenience of these purchasing options is that these managerial chairs are ergonomic seating friendly. Without the size or lack of mobility usually associated with executive furniture, these executive desk chairs provide function and comfort. Any manger with these ergonomic seating options will be cool, comfortable and productive in any environment they find themselves in. Light, sturdy and easy to move. These mesh chairs, available at Office Furniture Concepts, take a simple concept and offer the best choices and options for the best chairs to complement and enhance any office. Products are for sale at better prices than office furniture outlets at Office Furniture Concepts. Let Office Furniture Concepts team up with not only your clean, sleek and modern office furniture, but also provide a minimalist option to other office chairs to make your workspace spectacular. Mesh chairs gives the easy maintenance and size that is needed for anyone who is constantly not on the go or at their desk.